At our June 2018 Reunion in Annapolis, Maryland, a highlight of our activities will be visiting "Abington", the Gaither family seat beginning in 1649 - - 369 years ago! John Gaither and Robert Proctor were the original patentees of the 875 acres of what they named "Abington". Its size and Gaither family ownership has waxed and waned over the succeeding centuries. While I have not yet completed my research into the chain of title for the property, as late as 1855, a Thomas and Rebecca Gaither sell 46-1/2 acres of Abington, which were conveyed to them by Rezin and Sarah R. Gaither in 1853. Gaithers, by far, have enjoyed the longest period of ownership at over 200 years! Today, Abington is a horse farm in private hands, with a fraction of the original acreage remaining under that name. 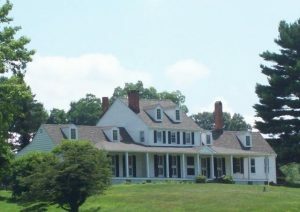 In 1975, it was accepted into the National Register of Historic Places. The land's wonderful fundamentals, which surely motivated John Gaither's astute selection, are still apparent. The house is perfectly situated on a rise at a spring head of the South River, between the North and South Forks of that River. In other words, very fertile virgin land. What is believed to be a portion of the original cabin is incorporated into the existing house. Old outbuildings also are scattered about the property, including a spring house and ice house. The current barn dates to 1902, and built into one of the stalls is a 1790 boundary stone between Abington and the adjoining "Brandy" . When "John Gaither, Sr." died in 1702, his wife and executor Ruth made an Inventory that gives us some insight into the house and property 50 years after its settlement. Items listed in the "Lower Room" included: 2 featherbeds and furniture, one couch bed, 9 leather chairs and table, chests, trunks, guns and linens among other household items. "In the Chamber," additional items included 4 more beds, 6 high leather chairs, a table, and chests among other items. The separate kitchen house contained 97 pounds of new pewter and 63 pounds of old pewter, along with typical kitchenware such as: andirons, iron pots, 3 brass kettles, 2 skillets, and candlesticks. Livestock included: 13 Cows, 7 Calves and 3 steers, 13 horses, three mares and one colt, 37 hogs, 7 pigs, and 17 sheep. 364A of Abington; 200A of Gathers Range, patented 4 Sep 1672; 391A of Pole Cat Hill, acquired 21 Feb 1684; 100A of Freemans Fancy, purchased 9 Feb 1685; 75A of Freemanston, purchased 9 Feb 1685; 70A of The Landing, purchased 9 Feb 1685, together with one 91-year lease for a Mill; and 120A of Round About Hills, acquired 16 June 1686. These purchases gave the Gaithers a fabulous assemblage with control of the head of the South River, a commanding location at the headwaters of this important colonial waterway. It would be an understatement to say that the Gaithers had a keen sense for quality land and an impressive vision in accumulating these holdings. It will be a very special experience to see and admire the land where our Gaither family tree is rooted! This entry was posted in Annual Meeting, Did You Know? by Nancy Jones. Bookmark the permalink.